Donald Trump may extend his controversial visit to the UK, with the US president understood to be considering a longer stay in order to play golf. The president is due in Britain for a two-day working visit on 12 and 13 July, although the full programme is yet to be confirmed.On the cards for Mr Trump's trip is tea with the Queen, a dinner with Theresa May and a visit to the prime minister's country retreat Chequers.No details have yet been officially confirmed.But Sky News understands the president is exploring the possibility of staying here for longer so he can include a round of golf or two - possibly with a famous golfer, or perhaps a celebrity who plays golf.The president's penchant for the game is not without controversy.While campaigning to become president, MrTrump criticised his predecessor Barack Obama for spending too much time golfing. 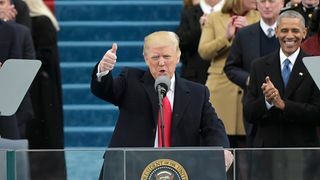 Thumbs up on Trump's first year? Mr Trump said he would not have enough time to play the game because he would be working so hard for the American people.But critics say the US leader is already spending far more time playing the game than Mr Obama.The website Trumpgolfcount.com claims the president has clocked up 103 visits to a golf course since becoming president. This is at a cost to the US taxpayer of more than $67m in security and travel expenses.Mr Trump was invited for a state visit to the UK by Mrs May when she visited him in the White House shortly after his inauguration in January last year.It is understood Mr Trump's aides requested the honour in return for positive noises from the president regarding a post-Brexit trade deal between the US and UK.The invitation remains open but it is thought a state visit is unlikely to happen this year and may never happen at all, given the likelihood of being overshadowed by large-scale protests.Instead the trip in July will be a working visit.This will be more low key than a full state visit and less likely to be overshadowed by protests against the president, who remains deeply unpopular in the UK. Mr Trump will arrive in the UK the day after visiting a NATO summit in Belgium.He may also use the opportunity to visit his properties in Scotland, among them his two golf courses.